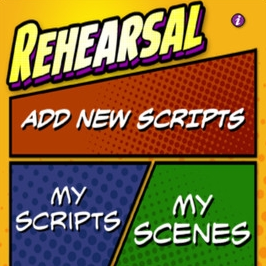 One day, I woke up to a review of my app, Rehearsal, in the magazine actors reach for to get up-to-the-minute news and advice on their acting careers. They had never reviewed Rehearsal, even though I’d mentioned it to them when I wrote their VO column for years. And what they said about my app caught me completely off-guard. Most of the time, reviews of my app are cursory, superficial, and usually complain that it costs $19.99. I wonder sometimes if the reviewer even is an actor. I was a bit dumbstruck. Someone, in the business, actually took the time to put the app through ALL of its paces, and discovered all that Rehearsal has to offer. Then, he shared it with other actors in Backstage. 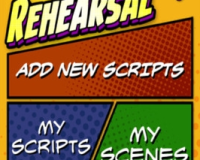 IF you want to grab a copy of the latest version, Rehearsal® Pro, you can here. Just wanted to let you know that I did read the article about Rehearsal 2 in the Backstage article. I thought the article was great and as stated, did more than complain about the price. I discovered Rehearsal 2 a couple of years ago and have been loudly singing its praises ever since. I recommend to all my on-camera students, and have encouraged my manager and agent to recommend it to their other clients as well. I think it is worth twice what I consider a very low price. It is user friendly and a great tool, especially if an actor has to self-tape and has no one available to read the other part(s). Well done, David. Long overdue recognition from an industry pub. Let the flight from shelves begin! I bought Rehearsal 2 about a month ago and haven’t had a chance to really put the app through it’s paces, but it seems to a worthwhile investment. Especially if it works smoothly as a scene partner. I noticed the app hasn’t been updated in 2 years, though. Is there an update planned in the near future, David? It depends upon what you mean by “near future.” There is a new version coming, but I have no release date set yet. I will tell you that we’re about 70% done. But the current version works just fine for the 70,000 or so users now using the app, including me. Yeah. I bought the rehearsal 2 app awhile ago. It worked great. However, it now says that it won’t work with IOS 11 and to contact the software developer for an update to it. I know you’ve upgraded to the Rehearsal Pro, but my rehearsal 2 needs an update for the current iPhone IOS. Pro IS the replacement for 2, and it’s a paid upgrade, so now YOU have to upgrade to Pro as well, Patrick. Apple can’t say anything but their stock “this app is not compatible, contact the developer”. Yes, you’ll need to upgrade to Pro, which you haven’t yet purchased (you’d apparently purchased version 2 a little over 4 years ago). Users have been automatically messaged in the 2 version of the app every month for the last couple of years, telling them to upgrade to Rehearsal Pro. Wow! This app is amazing. Thank you so much for developing it and making it available. I was able to learn my scene in a few hours, and I kept my earphones in listening to it the whole time I was waiting to audition. It made waiting a breeze instead of a chore. I was there for almost 45 minutes, and I stayed focused and ready until the time I went in. I love this app! I wrote a comment on the article too. Thanks for making an easy to use tool – it really comes in handy! Shoot, just realized I can’t get the app because I only have a MacBook Pro and a Samsung phone. Perhaps I will have an i-phone or i-pad in the future. It doesn’t matter what computer you have (Macbook Pro is fine, as is any other), but your devices do matter, and yes, you can’t use it with Android devices. David..love this post and am so glad I am connected with a coach like you. I am amazed by all that you know and share with others to help them succeed.